* The score would be a full point higher – 7.5 – if the component colour problem didn’t make it so painful with four players. Our review copy of 2019: The Arctic was kindly supplied by the author. Thanks a lot! The year is 2019. Due to rapidly increasing demand the world is an estimated three years from exhausting the developed oil and gas supplies. A good amount of untapped resources still remains, and although these are located in hard to access corners of the world like the Arctic, profit from controlling those resources far outweighs the costs. The bigger problem for you and your oil company is that those areas are not controlled by a single government. But all that means is that this time, you don’t have to control a single government for your profit, you will have to play five of them more proficiently than your competitors. The five unfortunate countries that are about to turn into tools of your corporation are 2019’s permanent members of the Arctic Council: Russia, Norway, the European Union, Canada and the US. That’s the situation 2019: The Arctic puts you in at the start of the game – it’s depressing how realistic this vision of the future seems. You are in control of a big oil company out to exploit the resources of the Arctic – but a company is still not allowed to control territory, that’s the privilege of governments, and so all you can do is send lobbyists to the five Arctic Council member states and control their decisions. Yes, it’s basically worker placement, but not in a way you have seen before. On the board, you see a map of the Arctic Circle with the North Pole at the centre and the surrounding nation’s coastline on the edge. If you’re geographically challenged like me, you’ll take a moment to make sense of what is where, but the colouration of each country’s coastal sectors in the country’s game colour will help you get your bearings. 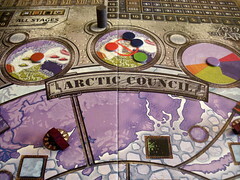 At the start of the game, each country has control of its coastline – the only sectors that can not change ownership during the game – while all the rest of the Arctic is uncontrollable by decision of the Council. Each country also starts with some ships in the water and some money in the treasury – the number of controlled sectors and ships and the amount of money varies from country to country, but as they are not directly controlled by the players, that’s not an issue. Each country also has – this is where you and your company enter the scene – three spaces to place lobbyists. 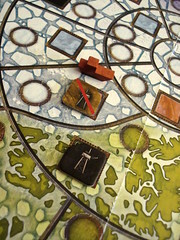 At the start of the game, players simply take turns placing theirs, in later rounds you pay for the privilege to pick your spot early. Once all lobbyists are lined up to do their dirty work, it’s time for action. Always starting with Russia and proceeding westwards, each country gets to act. In each country, the lobbyists act from top to bottom and pick one action for their country to take. The first one gets the free pick from all six actions, the second and third have less options because no action can be picked twice in one round. With a government’s full force at your beck and call, you might want to do many things, but one of them stands out as the most beneficial in your line of business: constructing a mining platform. As you start with none of those and you’re in the business of selling oil and gas, this action is rather popular. You can construct a platform in any sector controlled by the current country that doesn’t have one already, paying a concession fee to the country and the construction cost to the bank. Depending on the distance to the pole, the total damage is between two and four coins, a noticeable chunk of the ten coins you start with. You could also save the concession fee and construct an illegal rig in an uncontrolled sector as long as there is one of the country’s ships, but illegal platforms are not entirely free of problems as we will see in a bit. Especially early in the game, you will only get to build platforms as the first player in a country, but the way to victory is making good use of the other ones, anyway. You can do simple things like collecting taxes for the country or expanding its fleet – both boring but necessary actions – but you can also make the hard decision and declare war on another country using the Diplomacy action. Yes, there is the possibility of war in the Arctic. Actually, it’s pretty much a certainty, the open question is just between whom. Don’t worry, 2019: The Arctic does not go all the way to become a war game. 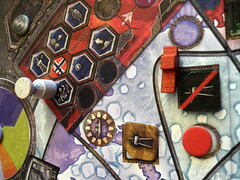 Armed conflict is a major part of the game, but the mechanics for it are very light. There is only one type of unit – ships – and when you chose to move ships each ship can move to an adjacent sector. When a fight breaks out, an equal number of ships is destroyed on both sides, there is no dice rolling or other source of randomness involved. However, destroying ships is only a means to an end, what you really want to destroy is your opponents platforms. Destroying platforms is an equally simple numbers game: you need two ships to destroy a legal platform, only one for an illegal one – that’s one of the downsides I mentioned, another one being that illegal platforms can be attacked even when no war is going on. Each neutral ship in the sector requires an additional ship when you’re trying to destroy the platform – those additional ships probably distract the neutrals from what’s going on, war hates spectators, after all. As the last of the country actions, you can cause civil unrest. This action is popular with the last player in a country, even more so when he has no platforms there himself, because civil unrest stops all production in that country for the round. We have found this to be too powerful in many situations as it makes a huge difference in profit and there is absolutely no way to prevent it. Fortunately, that is the only balance problem that we noticed in the 2019, and we came up with an easy workaround: you can chose the civil unrest action but decide not to stop the production. You make sure that your platforms will produce, but at the cost of one of your precious actions for the round. If all those options were not confusing enough already, you can also withdraw your lobbyists and receive some money from the country’s treasury. Or you can send them out to a platform in order to protect it from destruction. Finally, your choice of action also determines whether your little helper will stay in the country and be in a good position for the next turn or return to you and will most likely cost you some money to redeploy next round. That is really quite a lot of options, and while all of them are useful in the right situation, you won’t be able to tell when that is in the first few games. Our first two games looked a lot like a caveman trying to comprehend the TV remote: poking things to see what would happen. 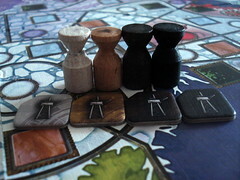 From the third game on, there was something like coherence, maybe even strategy in our playing. But you really have to play those two or three games before you start having an idea, this is a game with a learning curve. After all your lobbyists are done subverting the democratic process, you finally get to rake in your profits. Mind you, you won’t need a big rake. Each resource you produced, regardless of its colour, can be sold for exactly one coin. On the other hand, each resource can be converted into two victory points by itself, and if you have a set of all three – oil, gas and concretions – you can make ten points from that. You also can’t save any resources, you have to exchange them for either points or money on the same round. With those options, every coin you need from selling resources is extremely painful, but without money you won’t win the game, either. Before you get a chance to repeat all of the above, the end of the round can still bring far-reaching changes: the Council decides about the future control of the Arctic. There are three options which law can be in effect, decided by a vote between all countries. Which way a country will vote can be changed using the Diplomacy action, and while it may seem a more peaceful use of Diplomacy than declaring war, the effects on an unprepared opponent can are more devastating. What the council decides is who has control over sea sectors – remember that coastal sectors never change control. The default option is that sea sectors can not be controlled, meaning that every platform built at sea is illegal. The other options are that every country controls sectors north of its coastline – effectively making all sectors controlled – or that sectors are controlled by whoever has their ships there. When the majority in the council changes and a new law takes effect, the effect on the map is immediate. All sectors’ control is updated, as is all platforms’ legal status. When you have a platform in a newly uncontrolled sector, it becomes illegal – very annoying, but no big deal. If, on the other hand, a sector is suddenly controlled by a different country, your platform is lost. The only way to prevent the loss is to have a lobbyist protecting it. A well timed change of law is easily the most destructive move in 2019: The Arctic. And to add yet another thing – this is the last, I promise, unless I remember something else – on the second round China joins the race for the pole. China, as even I know, does not have a border anywhere near the pole, but in 2019 its hunger for resources has grown so much that they will take what they need by force if they have to. China is not represented like every other country, you can not take the usual actions with them. Every round, China sends another ship to the Arctic, and all their ships move straight north. If a round ends with China controlling the pole sector, the game ends. China is, however, not completely immune to our influence. Spending a bit of money, one player can control China’s actions for a round and either move their ships or build a platform. When the game ends – either because China won the pole or because the ninth round is over – more victory points are awarded based on your money, the number of platforms in each colour and the lobbyists in the country controlling the north pole. Especially that last one can still make a difference at this point, the suit-wearers clock in at ten points a piece, but don’t rely on this final scoring too much: you won’t catch up to an opponent that outplayed you the whole game just because of it. With all the options you have in 2019: The Arctic when the game ends your brain will be sweating. While each action you can take on its own is not too difficult, putting them together to achieve what you want is even harder than it sounds. The amount of possible actions you can take is to blame for that only in parts. 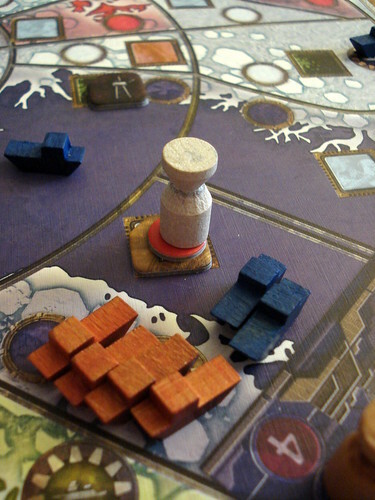 There is also the fact that you don’t have any pieces on the board that you own: when you move the Canadian ships, someone else can use them to build a platform before you get the chance. Also, some actions – especially the change of control laws – have a very big impact on the game all at once and being prepared for them is not easy. The overall feeling is that every decision you make counts: you’re always low on money, don’t have enough actions per turn to do what you want, and if you have money and actions you’re likely behind on victory points. In games with three or four players, being a bit behind doesn’t even have to be a bad thing. There are a lot of options to bash the leader and anyone pulling ahead early can be sure to learn about them. You might want to take this as a general word of advice: don’t play 2019: The Arctic with sore losers – actually, don’t play anything with sore losers, but especially not 2019. This game has a huge potential for negative interaction, and if you want to have a shot at winning you have to put down your opponents when you have the chance. There is no space in the Arctic to build your empire peacefully while the others fight it out. While I’m very happy with 2019: The Arctic, there is one thing that leaves a slightly sour taste: the components. The illustrations are not to blame here, the board is utilitarian but good-looking and presents all the information you could want. The problem is the colour choice for lobbyists and mining platforms that makes the game virtually unplayable in 4 players. Three colours are easy to tell apart: white, beige and black. But the fourth colour can only be called “the other black”. When you look closely and in perfect light, you can tell that one of the blacks is a very dark brown, but under normal conditions your best chance to tell the two colours of lobbyists apart is to shine a bright light in their face and repeatedly yell “Who are you working for”? The oil platforms are even worse as there is a fifth colour of platform counters that falls somewhere between black and black – probably a printing problem. 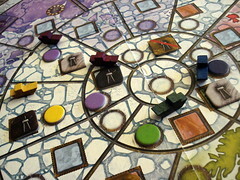 Those problems are fixable by painting one set of components in a more obvious colour, but I much prefer my games to be playable without home improvements, and when the components make a game that hard to play, that has to impact the total score. Oh, I just remembered another detail to keep in mind when playing: Norway can join the European Union.